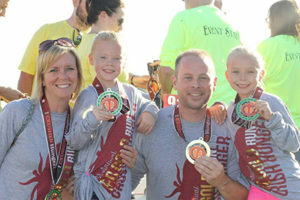 Registration for the seventh annual Red Gold ‘Run to Crush Hunger’ is now open! Register now to be part of the event’s 10K, 5K or one mile runs. This year’s event gets running at 8 a.m. Saturday, Oct. 13, at St. Joseph Center in Elwood. 1 mile – 10 a.m.
Can’t make it the day of the race? No problem! Sign up to be a “virtual runner” and support the cause wherever you are! As an added bonus, State of Indiana employees receive a 15 percent discount on registration fees. Enter Indiana18 to receive the discount. The ‘Run to Crush Hunger’ is making a difference in food insecurity in The Hoosier State. Did you know? Each runner helps feed approximately 120 Indiana families! Prizes are available to top finishers and every participant takes home the event’s “ultimate performance: long-sleeve t-shirt and custom finisher medal. Don’t miss your chance to help Hoosier in need and get outdoors this fall!